Stout and Szechuan? Marrying Beer and Food Pairing food with a favorite vintage isn't just for oenophiles anymore. The beer industry is pushing beer-food pairings as specialty beers become more popular, and as Americans' palates become more refined. A sampling of beers and their recommended food pairings from the Brewers Association. Everybody knows that beer goes well with hot dogs. Some people even know that dark stout is better than champagne with oysters. But Imperial IPA with creme brulee? This is a new one — at least to me. There are members of the dining public who know, or are learning about, what beer goes with what food. Thank Jimmy Carter. In 1979, he signed a bill repealing federal restrictions on small-batch home brewing. Basement brewers had so much fun that many of them went pro. The Brewers Association says that of the 2,000 breweries in the country, 1,400 are so-called craft brewers. That means they're small (fewer than two million barrels), independent (a mom-and-pop brewery rather than a multinational corporation) and traditional (their beer is mostly malt based). Lucy Saunders, who has been writing about the craft-beer movement for 20 years, says brewers have been promoting food and beer pairing. She says it was bound to happen as the spicy foods of Southeast Asia and the Caribbean became more popular, and as entertaining and eating out became more casual. But beer can also be elegant. New York City's uber-popular and refined Gramercy Tavern now has a vintage beer list — which means it sells old beer. Some is bottled in a special way, and some is stored in wooden casks like wine. Saunders says these aged beers taste as complex as any wine. And some have price tags you don't associate with a six pack. The slightly woodsy taste of barrel-aged beer goes well with bittersweet chocolate desserts, Saunders says. Another clue that beer has moved from the House of Commons to the House of Lords is the existence of the beer sommelier. He'll help you choose the right beer for your entree and make sure you aren't served beer in the wrong glass. A wildly effervescent brew needs a different glass than a still beer. There are an increasing number of books on what beer to drink with what food. The Brewers Association has a guide on its Web site. Pale ale, for example, is great with a burger. A strong golden ale complements crab cakes. Oatmeal stout is a good choice with Oaxacan mole and a classic Pilsener is nice with salmon. 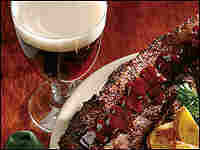 Try a pale bock with Korean barbecue. And a ballpark hot dog? Saunders likes hers with spicy brown mustard and dill pickle relish. An amber lager, she says, stands up nicely. Bonny Wolf is author of Talking with My Mouth Full and host of 'Kitchen Window,' NPR's food podcast.